It is the weekend. You need something to run away from your working life fiasco. I do not usually cook for therapy. But, when I do, I make it worth. It needs the perseverance to make the Hollandaise Sauce. If you are successful to create the silky sauce, it is a sign that you can face any challenges. Creating the sauce teaches you to not give up, to get smart, and you need a pinch of hard work. Not everything can be achieved with only being smart. You still need the sweat to accomplish it. Melted unsalted butter. If you use salted butter, do not add salt. See, these ingredients are simple. No need those unfamiliar herbs or that expensive extra virgin olive oil. Thanks to Jamie Oliver's video, I was inspired to create this sauce. In a bowl, crack the egg yolks, pour the lemon juice, dash the salt, and pour the water. Stir it, and then, with a blink, it becomes curdy. And then you pour the hot melted butter. 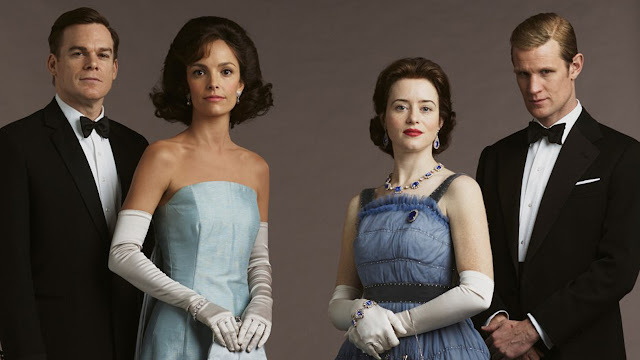 Your Hollandaise Sauce is now, a sour scrambled eggs. That is how you make a failed Hollandaise Sauce. This happened a month ago. I was devastated. Oliver made it seamlessly and everything I did was intermittent. 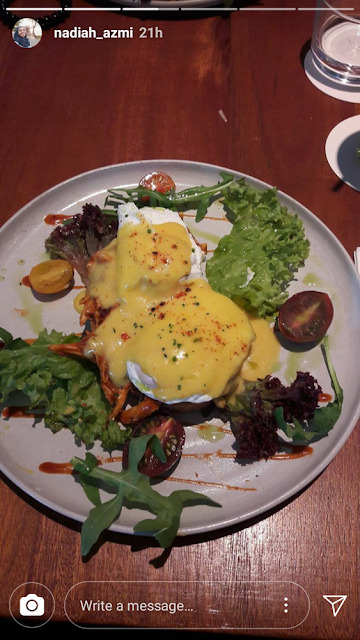 Yesterday, I made it again, after I saw my friend posted a delicious eggs benedict for brunch. Your skill and intelligence matter. When egg meets heat, you get sunny side up. So, melt the butter first. Let it cool after that. The water must not be boiling hot. If you have a water heater, heat the water. Use that hot water. It is hot, but not boiling hot. Basically, do not even use your stove to make this sauce. Whisk it, until it becomes foamy. Turn on your perseverance mode. You must not give up. Keep whisking. This is why you need strong hands. While whisking after a long time, add more hot water to the pot, to maintain the heat. The pot, not the bowl. Do not get confused. Now, it is time for you to pour the melted butter into the bowl. Which is already cooled. 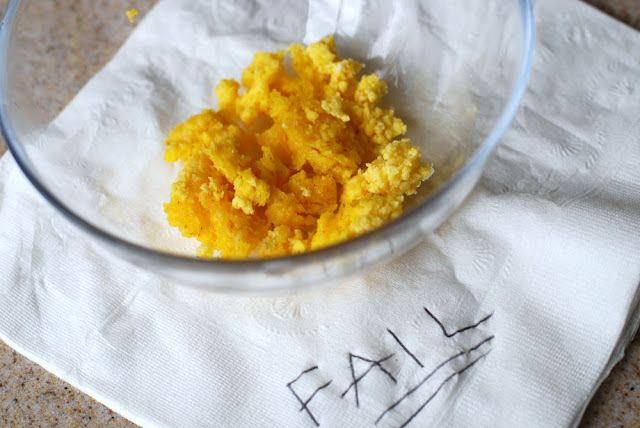 We want the butter to emulsify with the egg yolk mixture. We do not want it to separate. So, you pour it a bit for the first time, whisk. Pour it a bit for the second time, whisk. Keep whisking. You see the butter not emulsifying. You can see the liquid butter. But please, perseverance, just keep whisking, just keep whisking. And then you pour the whole melted butter, whisk it, throw the hot water from the pot, add new hot water to the pot, and then continue whisking until it becomes creamy, silky, yellow and yum. 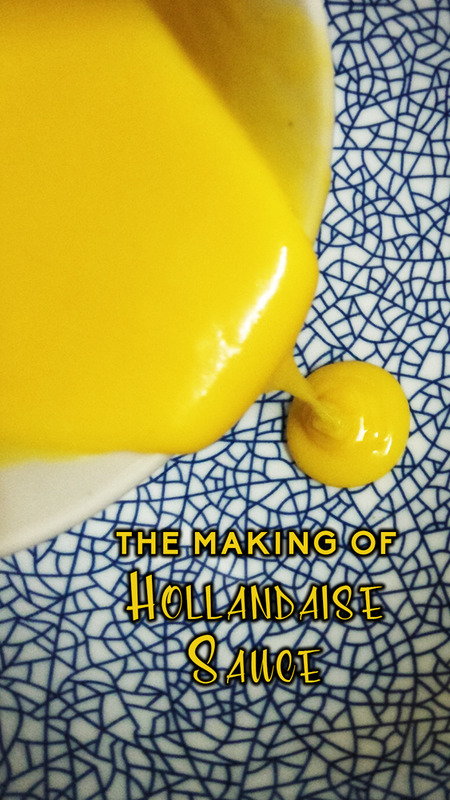 You see, the new heat from the new hot water, with your strong hands whisking it non-stop, with your perseverance to keep whisking it, that is the key to an emulsified Hollandaise Sauce. Oh, yang mana satu? Yang sos itu ke, atau yang poached eggs, yang kawan I post kat Insta stories dia itu? Kalau nak mudah, boleh pakai mixer. Tapi hati-hati, bila pakai mixer, sos itu boleh jadi pekat sangat, jadi butter. Caranya, kalau pekat, tuang air suhu bilik sikit-sikit sampai dia kurang pekat. It surely does not easy! Untuk saya yang lagilah tak tahu memasak, nampak pun boleh faham bukan mudah. Apapun, kalau minat, mestilah harus terus mencuba. Btw, the sauce really looks good! Buat sos ini pun, sebab bahan dia tak mahal sangat. Selalunya orang pakai sos ini untuk brunch. Makan dengan poached eggs. Simple ingredients yet a tough process.. tak tahu la ku sanggup ke tak nak kacau sampai dia jadi pekat tu 😂 but really wanna try it! 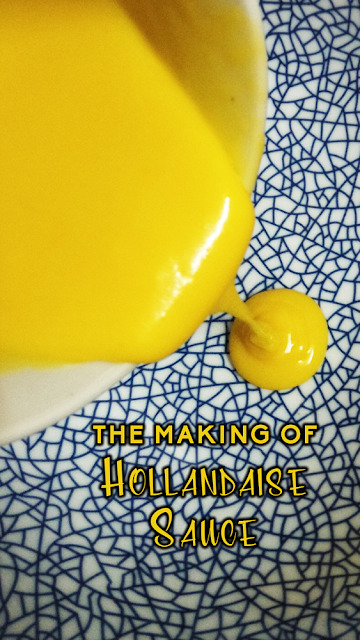 I've tried making hollandaise sauce once and failed terribly, maybe it's time to try again. The trick is to control your heat. Don't use boiling water for your double boiling. Use hot water from the water heater. Make sure your bowl doesn't touch the water. You need to keep whisking. You can use a mixer, but be careful. Your sauce can turn out to be as thick as butter. If that happens, pour room temperature water into the mixture and keep whisking until you find the right consistency. For sure needs lot of practise & high level cooking skill. Salute. Dapatkan telur omega. Jangan pilih telur yang lain. Selalunya tempat brunch. Upstairs Cafe SS12 Subang Jaya ada jual. tengok macam senang... kalau buat sendiri tak tahu la menjadi atau tidak terima kasih sharing! Kalau Lia cuba mesti dua tiga kali cuba baru jadi kut. Nampak senang tapi kena cuba dulu kan. Practice make perfect. Menarik ni ! Haha. Tak payah pening sangat buat scrambled eggs. Pastikan masak pakai mentega. Tuang telur ke dalam kuali, kecikkan api, kacau-kacau sampai hancur dan masak. Lepas itu tutup api. Kita tak nak scrambled eggs kita garing. Mengamuk mat salleh kalau scrambled eggs kita garing. Haha. It need a lot of patience to create a good sauce. Very detail recipes.